Our Display Garden and Nursery are OPEN EVERY WEEKEND in April and May from 10-5, including out very special Mother's Day celebration. May 4th & 5th Sat./Sunday. Demonstrations throughout the day, starting at 10 am. 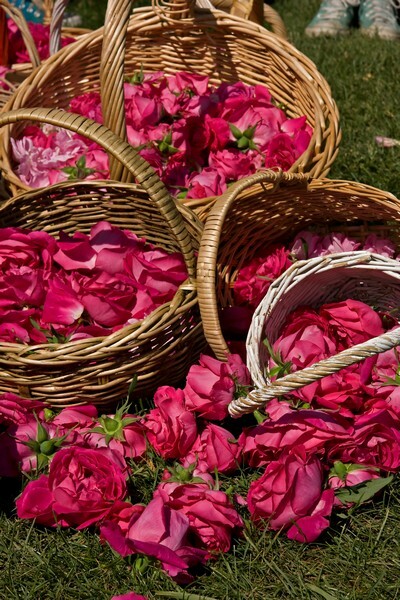 ♥ EXPERIENCE an authentic, behind the scenes peek at the ancient process of rose water and rose oil extraction. 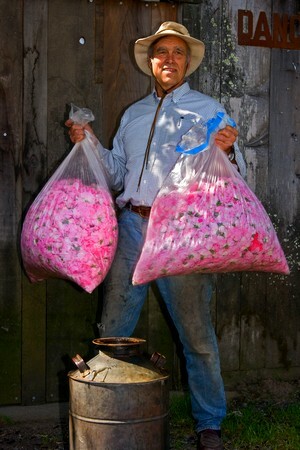 Staff will be on hand to explain the process and why only a hand full of roses are good enough for rose oil production. You can also see the fields the roses are harvested from. ♥ VISIT Our Gorgeous Gardens in Full Bloom. and 200 kinds of irises. the 'Hollywood and Vine' Roses, and so much MORE. NURSERY OPEN 10-5 & filled with fragrant roses, irises & perennials. Garden and NURSERY OPEN 10-5. Enjoy this special day in honor of our wonderful Mothers. Wander through the rose garden AT FULL BLOOM! 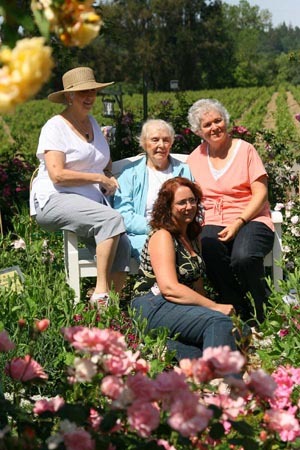 Many families have made a Mother's Day visit to our garden a family tradition. Allow yourselves this day to really "Smell the Roses"! 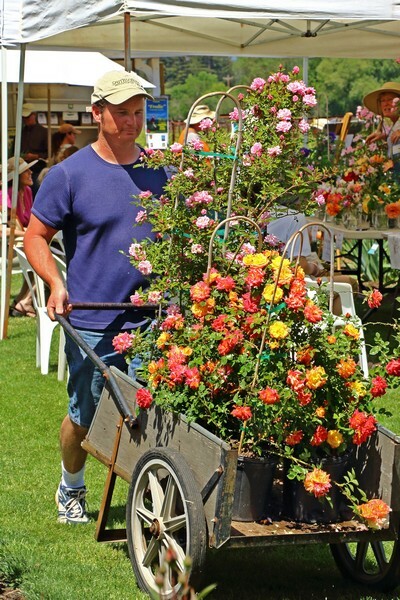 Maybe even select a rose plant for Mom to take home! Experience the beauty and fragrance of 650 verieties of roses as you stroll down the Rose Allee with huge rambling roses billowing down from 12'x12' arches. Also, enjoy our secret garden treasures: "the Purple Playground", the "Humming Bird Wall", "Hollywood and Vine", "7 Dwarves", "Children's Garden" and the "Kitchen Garden" collections and see California's ONLY Perfume Rose Fields --- in Full Bloom!. Nursery open and brimming with roses and hummingbird/butterfly attracting annuals & perennials. Check out our gift shop with many unique items such as our ultra-fragrant, estate produced Rose Water. The Rose water comes in a gift bag with 14 simple and delicious recipes and a blurb about its unique origins. Garden & Nursery Open 10-5 $2 donation. Visit our Enchanting Gardens - Inhail the scent of 650 varieties of roses perfuming the air. 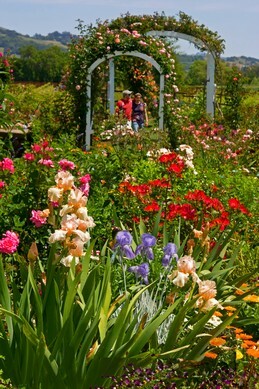 Wander down the 400 ft. 'Rose Allee', explore the Butterfly Garden, Hummingbird Wall and many other delights. 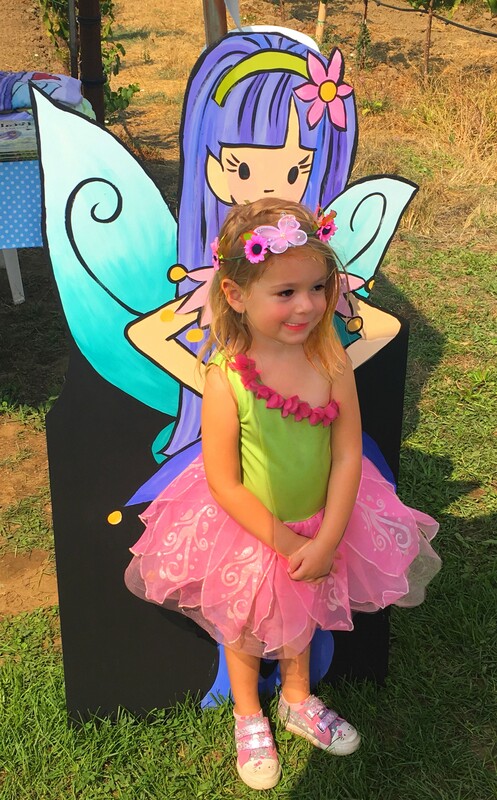 Meet and Enjoy Angela Sage Larsen, author of the famous Petalwink the Fairy book series, reading her stories in her cheery way (Sat. @ 11 & 2/ Sunday @ 2). 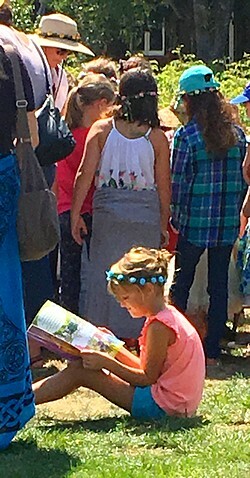 Following the reading, she will be available for book signing. 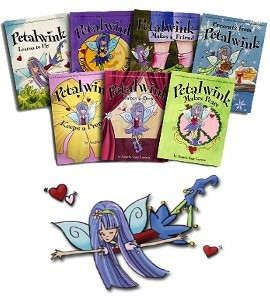 Click HERE for more about Petalwink. Peek into our NEW Children's Fairy Garden, an enchanted village of special fairy houses, flowers, cottages, streams and sparkles. 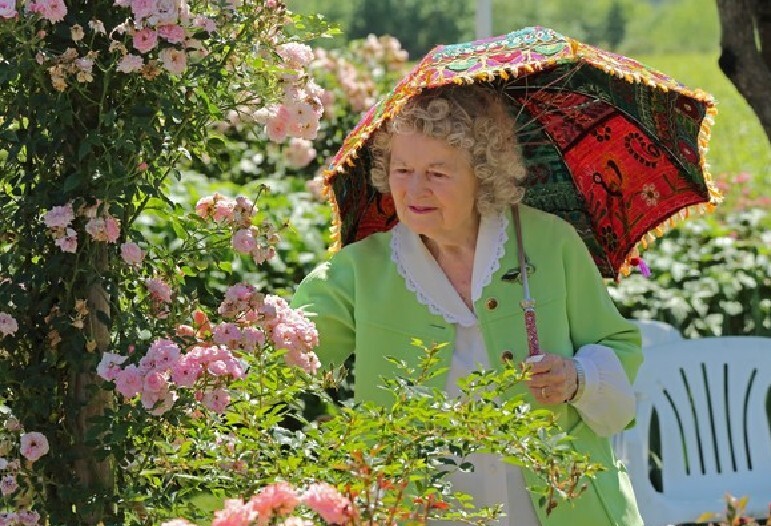 Visit California's only Perfume Rose Fields- Immerse yourself in the scent of hundreds of specially selected roses from Bulgaria, France and Persia. Planted, en masse, for the production of rose water and rose oil. Sample: our ESTATE grown and produced rose water and rose oil perfume "Rose Embrace". 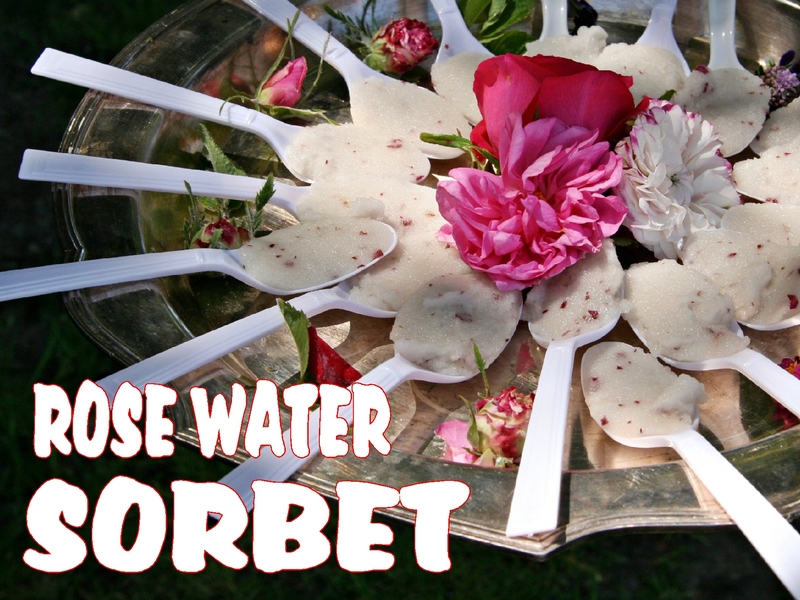 Treat yourself to a taste our wonderful rose water sorbet -- Yum. NURSERY OPEN and fairy full of gorgeious roses, irises and perennials for sale. 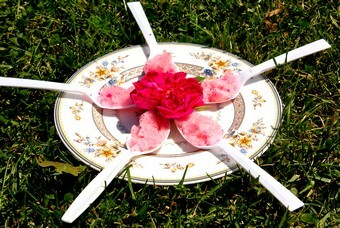 "Tea and Memories in the Rose Garden"
$4 Donation includes Tea Service. No reservations required. 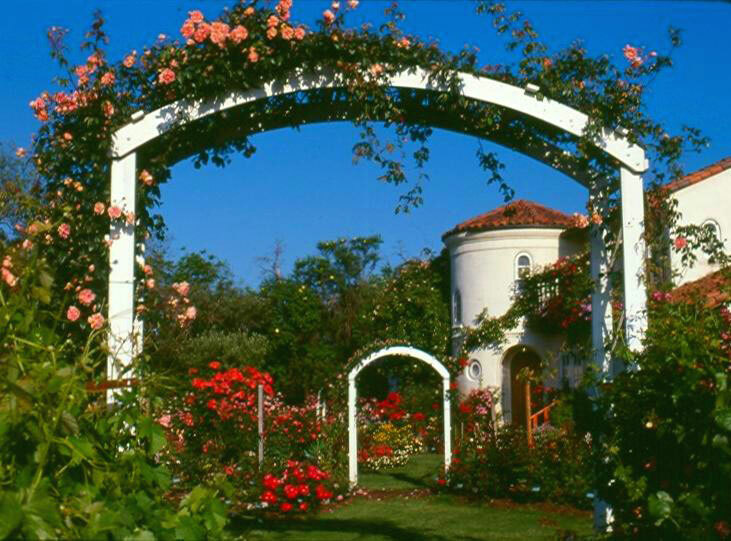 Sip a cup of organic TEA as you enjoy the scents and sights of our beautiful Rose Garden, with its collection of 650 varieties of antique and modern roses, surrounded by the lovely, rolling vineyards of Dry Creek Valley. Tables and chairs will be set out throughout the garden, so you may 'sit and sip' while watching butterflies and Hummingbirds flit and hum around you. The tree will slowly fill with hundreds of these beautiful fluttering messages. Absolutely Lovely! Enjoy the 400 ft. 'Rose Allee', a series of 8 - 12' x 12' arches covered with billowing roses. Explore the 'Butterfly Garden', Hummingbird Wall and much more. Sample: Estate made rose water, Perfume and rose water sorbet. Limited quantities will also be available for purchase. perennials for birds, bees and butterflies. End of Season Plant Sale !! !